Objective markers are probably the last thing most people think about for their armies, but it can really help theme your force more. Not all scenarios call for them, but when they do it's nice to have something that fits your army over just a piece of paper or a dice. To be honest, I don't know if I would have built objectives if it weren't for Adpeticon. 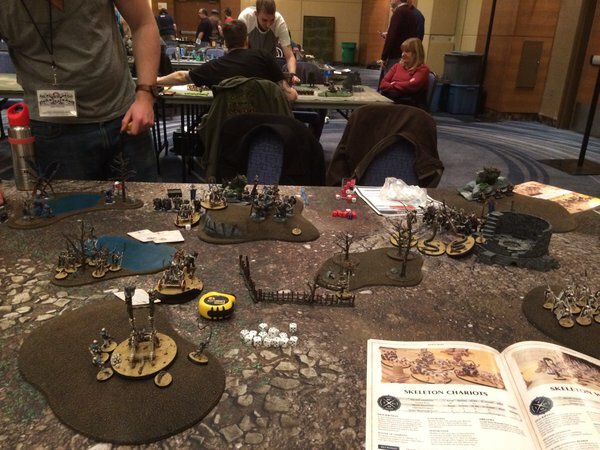 The comp pack called for six objective markers, one flag marker, and a messenger. I put it off till last, waiting to finish all the rest of my army first. I kind of wish I had started on them earlier because I had some larger ideas for my markers that I had to scrap due to time. Ideally I would have made my six smaller markers mini obelisks. I searched around online for awhile and I found one or two possible good options, but I only had about two weeks left before the tournament. The markers had to be on 25mm bases and I had no idea how large the obelisks were that I found. In the end I settled for rummaging around in my bits box. This is often the easiest and best way to make these. My Tomb Kings leave me in a bit of an odd situation though since they are now discontinued. Every bit I have is a precious commodity. Luckily Tomb King skeletons leave me with plenty of extra banners and shields. I clipped them at odd angles and pushed them into some Milliput to look like they were half buried in the sand. It was really simple but in the end looks great and doesn't draw to much attention to them. This would be easy enough to do with some Stormcast shields, Orruk choppas, or Chaos shields. These six smaller markers are great for a bunch of scenarios including the Vital Objectives ruleset I created for AoS which you can find here. The flag marker is not something you see called for often and it needed to be on a 40mm base. I could have made a simple banner, but I thought the casket from the Casket of Souls would look cooler. I had a few spare caskets bits lying around due to some miscasts and having new ones sent to me. This one had a few bubbles in it, but it works good enough for an objective. Like I said, this isn't something you see called for often, but I would love using something like this in the Ritual scenario. The last model that I needed for Adepticon was a messenger. Again, my Tomb King bits are not something I can use willy nilly, so this one was a bit hard for me. I really had to think about what I was going to build. I originally built a rather elaborate model based off of the plastic Tomb King from the sphinx kit. I had one spare because I had used the arms from it for my own King on a chariot conversion. I had it all done and ready to prime and scrapped it because I decided it was too much. It threatened to overshadow some of my actual character models, plus I didn't want to spend a ton of time painting it. I restarted and went for something much simpler using some bits from a charioteer. This model suited my needs a lot more and looked like a simple skeleton tasked with delivering messages. I sculpted a scroll on one of his hand and he was ready to go. I actually really love how this mini turned out and feel like he has a ton of character depsite being rather simple. He's pretty hunched, which speaks to his "personality" I guess, and the head, which came from a banner I think, has a rather cool crack running from one eye. I of course got to use all of these in the tournament, and now I have them to use in all of my future games for my Tomb Kings. Not everyone has a looming tournament approaching to make them bite the bullet and make some objective markers themselves, but I would recommend doing it anyway. It doesn't take a whole lot of time or effort and will enhance your games that much more when you need to use them. It could easily be done between projects, or even while you are painting a mini and waiting for something to dry. 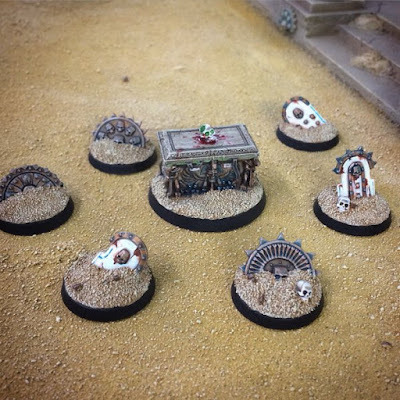 Have you made any objective markers yourself, for either AoS or 40k? Then let me see in the comments below.